When “The Muppets” storms the world’s multiplexes this holiday season, there will no doubt be lots of little kids who, thanks to “Sesame Street,” will associate the wide-mouthed cloth puppets with learning to count to 10 and reciting their ABCs. 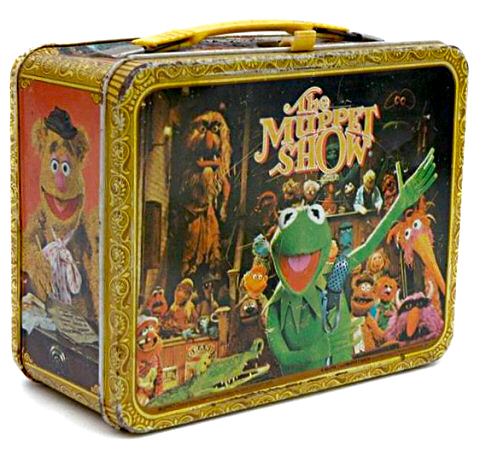 But for many of their Gen-X parents and Baby Boomer grandparents, “The Muppets” will conjure school lunch boxes, flannel pajamas, and brightly colored board games, all inspired by “The Muppets Show,” a variety-style hour of family-friendly TV that aired between 1976 and 1981. The cast of “Sam and Friends” now live in the Smithsonian. 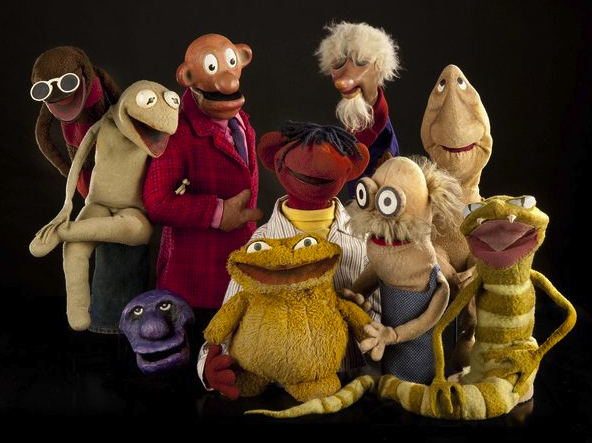 “Sam and Friends?” Lots of people who love the Muppets can name their favorite “Muppets Show” guest stars, from Connie Stevens to Vincent Price, Lena Horne to Johnny Cash. They probably also know know the names of most members of the show’s house band, Dr. Teeth and the Electric Mayhem (Animal played drums, of course), and they may even be able to recall that in 1975, a motley collection of alien Muppets with names like Scred and King Ploobis were featured on the first season of “Saturday Night Live.” By all accounts, it was not a good fit. 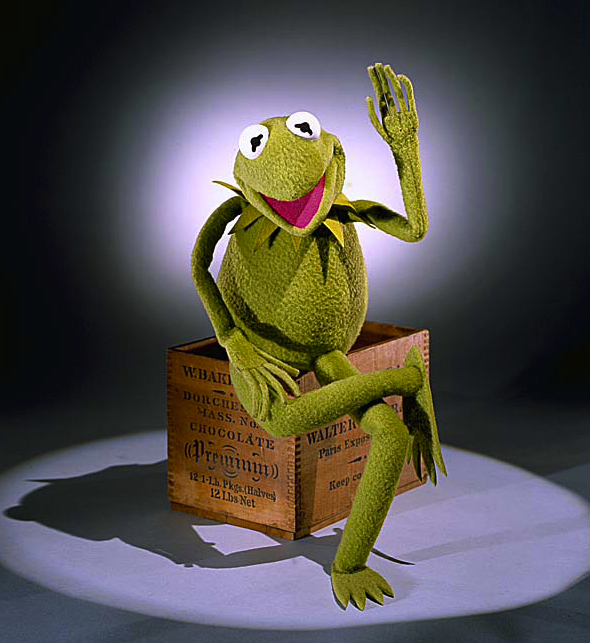 But it’s easy to forget that the earliest Muppets date to 1955, when a freshman at the University of Maryland named Jim Henson and his future wife, Jane Nebel, performed the first of 86 five-minute sketches of “Sam and Friends” on WRC-TV, the Washington, D.C. affiliate of NBC. The “Sesame Street” era Kermit has a crenellated collar and flipper feet. Despite getting top billing, the star of “Sam and Friends” was not jug-eared Sam, whose round nose and bald head suggested Popeye. 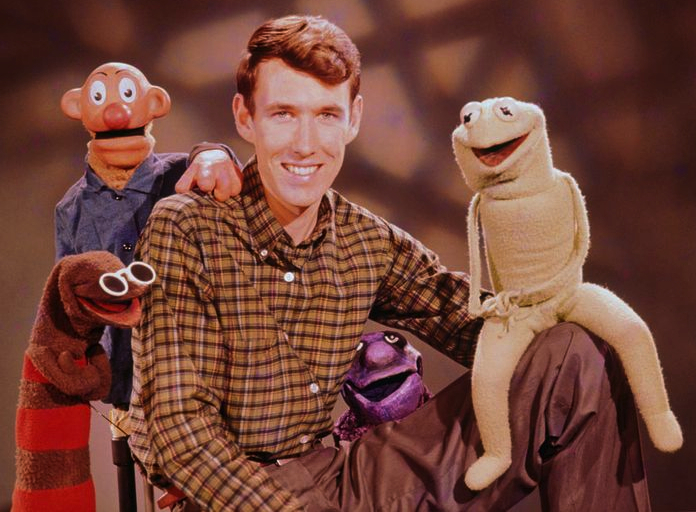 No, the show’s heart was an olive-drab, lizard-like creature named Kermit, who was sewn from one of Henson’s mother’s cast-off wool coats (that’s him, Sam, and a few other Friends at the top of this article, with Henson circa 1956 or 1957). The original Kermit had rounded feet instead of flippers, lacked Kermit’s classic crenellated collar, and viewed the world through a ping-pong ball that had been sliced in half and painted. Henson lined his creation with denim from an old pair of jeans. Naturally historian Bowers is one of the biggest fans of that show, which debuted in black and white before switching to color. “They call me ‘Mr. Muppet’ around here,” Bowers says, with no small amount of pride. That’s because he and his colleagues spent five years trying to add the “Sam and Friends” Muppets to the institution’s collection. “They’re creatures rather than specific beings, sort of like blobs of fabric,” he says of these prototypical Muppets. “Kermit had not graduated to being a frog yet.” If you want to compare Kermits, the Smithsonian has one of the “Sesame Street” versions, too. 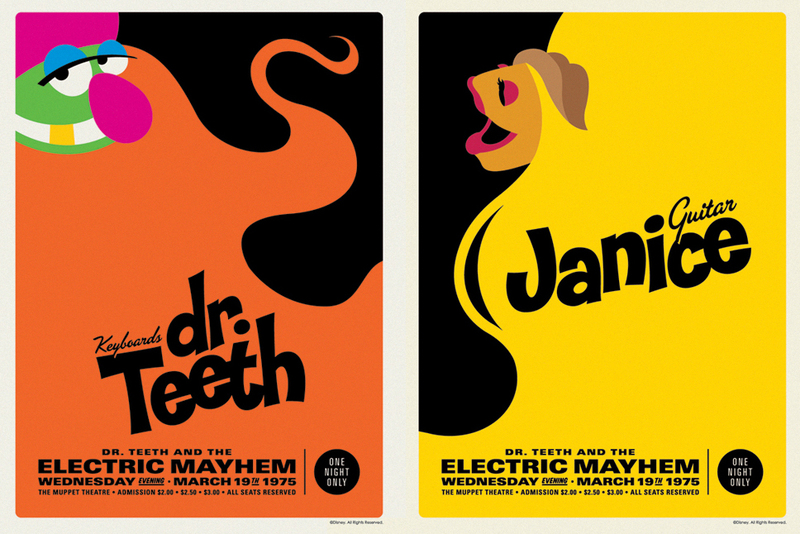 Michael De Pippo’s retro Electric Mayhem posters created a sensation on the Internet. He also loved music. “Jim was very interested in the pop music of each era he worked in,” says Bowers. “Many of those early ‘Sam and Friends’ episodes were just pantomimes to recordings. They would lip sync Keely Smith and Louis Prima. They would do performances with Rosemary Clooney singing ‘I’ve Grown Accustomed to His Face’ in the background. And when the song called for a female singer, Kermit just wore a wig.” Miss Piggy would have been so jealous. 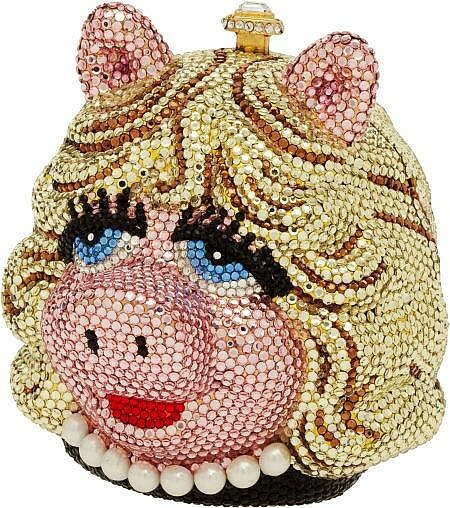 This Swarovski-studded Miss Piggy minaudiere was designed by jeweler to the stars, Kathrine Baumann. On “The Muppets Show,” the vehicle for Henson’s musical side was its house band, which, like Kermit, has its own legions of fans. For example, in anticipation of the new Muppets movie, a Toronto graphic designer named Michael De Pippo created gig posters for each of the original members of Electric Mayhem—Dr. Teeth (keyboards), Zoot (sax), Janice (guitar), Sgt. Floyd Pepper (bass), and Animal (drums). Originally conceived as a fan’s “homage for my love of the Muppets,” the posters went viral on the Internet earlier this fall and were quickly licensed by Disney, which is publishing limited-edition, signed screenprints of each poster via Acme Archives. De Pippo says that some of the 18-by-24-inch posters, which advertise a show by the band at The Muppet Theatre on March 19th, 1975, the air date of “The Muppet Show” pilot, should be ready in time for the release of “The Muppets” over Thanksgiving weekend. I can remember when Elton John was a guest on ‘The Muppet Show’! He did the ditty, ‘Crocodile Rock’ with The Muppet band…remember ‘Animal’..the Muppets Drummer? ?